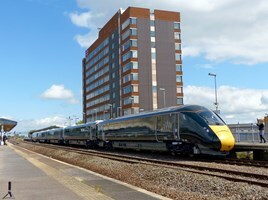 The ability of Great Western Railway’s Class 800 bi-mode electric multiple units to meet current and future timetables is under scrutiny by the train operator, due to their maximum speed in diesel mode of 100mph. Network Rail’s electrification of the Great Western Main Line is taking place on a discontinuous basis, and the trains will have to run on diesel power between energised sections at potentially lower maximum speeds than the current High Speed Trains, which can operate at up to 125mph. However, uncertainty about exactly which sections will go live (and when) means that planning future timetables when the fleet begins entering service from next year is proving extremely difficult. The Class 802s have a design speed of 125mph under electric traction. For more on this, read RAIL 808, published today. To read more on this, read The Fare Dealer in RAIL 809, published September 21. I think you mean the Class 802's have a design speed of 125 mph in diesel mode. Would it be better to have 802's on the GWR and send the 800's to the ECML then when the GW electrification is nearly finished, send the surplus 802's to Transpennine and Hull Trains? Both the GWML and ECML are 125mph and the Hitachi Class 800's, Class 801's and Class 802's IEP's can actually reach up to 125mph either on electric or diesel as they are bi-mode trains. Just thought I'd point out that the GWR Class 801s are now going to be bi-mode rather than 'pure' electric owing to the delays in electrification works. All Class 80x trains use the same engine pack, the difference is that they are downrated on the original Class 800 and 801. Turning into a right farce, only here could it be so much money be spent on disorganised chaos. The drivers are going to get plenty of practice going diesel to electric and back. Probably wear the panto raising gear out before full electric running starts.